How helpful are the terms ‘pagan’ and ‘Christian’, or the concept of the ‘conversion to Christianity’, in explaining the political, religious, and cultural transformation experienced in Scandinavian England in the ninth and tenth centuries? The Viking armies who came to Britain were initially followers of potentially diverse forms of paganism, with polytheistic beliefs and practices which were sufficiently fluid to adjust to the condition of being far from home and in contact in a variety of ways with Christian societies. Over time, English kings used the religious ritual of baptism to subordinate the leading men of defeated Viking armies (and perhaps their families). Some flexibility may have been allowed in the Christian ceremonies in these special circumstances. The Northumbrian Church seems to have lent its support to legitimise Viking kings, helping them to strengthen their hold over both their Scandinavian and their English subjects. The East Midlands was not a kingdom, however, but a region of Mercia, and the bishops of Leicester and Lindsey did not survive the Scandinavian takeover of 877, when ‘the army went away into Mercia and shared out some if it’. The subsequent division into smaller units based on central places (‘boroughs’) provides an interestingly different context, where paganism could arguably have flourished longer. After a military presence was established in defended centres like Derby and Nottingham there was also – eventually – a substantial settlement of Norse-speakers in the countryside. We know that these Scandinavians integrated into local culture, but we can only speculate about how they became Christian. Around the middle of the tenth century, the ecclesiastical map of the area seems to have been redrawn, shifting the centre of episcopal power south to Dorchester-on-Thames. 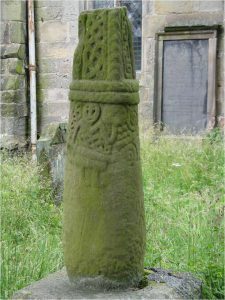 Arguably, the most visible impact the generations of new Scandinavian Christians made in the East Midlands was the production of stone sculpture which combined English technology and aspects of Scandinavian visual culture, signalling, perhaps, a perceived new identity for all the Christians of the region. Professor Abrams will talk about the conversion and Christianisation of the Vikings in England on 21st January 2018 from 1pm in the Djanogly Theatre, Lakeside Arts, University of Nottingham. This talk will not be livestreamed.